Is there still a case for dedicated sound cards? Thought you didn't need an add-in sound card for games? Think again. Asus has established itself as a player in the high rollers' hi-fi lounge with Xonar soundcards like the Xense, D2 and mighty Essence ST. Although still relatively new to the audio game, it can look old timers like Creative and Auzentech in the face without shame. 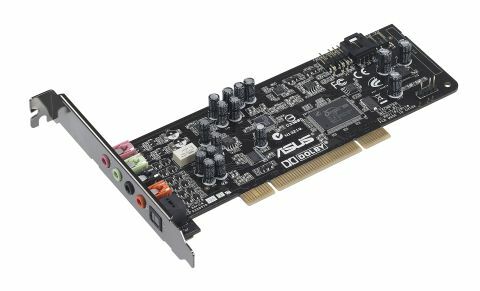 Asus' latest card, the Xonar DG, features some of the same components as appear on its more expensive boards, just not in such great quantity. It's specifically aimed at gamers rather than music buffs, though, with basic outputs for 5.1 PC speakers and – crucially – an on-board headphone amp. It's a tough job to convince anyone to upgrade from on-board audio, for the very good reason that most integrated sound chips are good enough for the majority's needs. Having made the decision to upgrade, should you be looking at something a little grander? We've used Rightmark's Audio Analyzer tool to give a top level breakdown of the card's performance. It's worth pointing out that this simply measuring variations in tones via a loopback from the speaker to the mic channel – effectively the card is listening to itself.